There are hundreds of different types of knives. If you are a beginner cook, start with 3 or 4 types of high quality knives. A good foundation is to begin with a chef's knife, a paring knife, and a bread knife. Specialty knives are useful, but can be expensive. Choose a set you can add to in the future. To choose a knife that is of good quality and best fits your needs, you need a basic knowledge of the various parts and construction of a knife. Carbon Steel - Carbon Steel has been used in the making of blades for many years. Carbon steel blades are tough and take a better edge with little effort. Carbon steel blades discolor when they come in contact with foods that are high in acid, such as tomatoes and citrus fruit. The blades must be treated with care to avoid discoloration and rusting. Wash and dry thoroughly after use. Stainless Steel - Unlike carbon steel, stainless steel blades do not discolor or rust, however, they are not hard enough to maintain the best edge. High Carbon Stainless Steel - A combination of the best attributes of carbon steel and stainless steel blades. They have the toughness and ability to hold an edge and do not discolor. Titanium - Titanium blades are made from a mold of titanium and carbides. When compared to steel, titanium is lighter, more wear resistant, and holds its edge longer. The titanium blade is more flexible than steel, they work best for tasks such as boning and filleting. Ceramic - Ceramic blades are made of zirconium oxide and aluminum oxide. Although they are much more delicate than steel knives, they tend to hold their edge up to 10 times longer. Once the blades have dulled, they must be sharpened by a professional. Plastic - Plastic blades are used with the primary goal of preventing vegetables and such from becoming discolored from the blade of a knife. Plastic blades are not very sharp and require some force when cutting. Hollow Ground - A knife blade with concave beveled edges created by starting midway, or lower, from the top of the blade and grinding or tapering each side of the blade thinner toward the bottom, or cutting edge, of the blade. This type of cutting edge results in a very thin and exceptionally sharp edge that can be easily sharpened. It is a type of blade that is excellent for slicing but not for chopping activities since the higher impact of the chopping action dulls or may chip the blade. Although these blades often have very sharp edges, the blade lacks the balance and longevity of a taper ground blade. Taper Ground - A knife blade that is manufactured with a single sheet of metal and has been ground so that it tapers smoothly from the spine to the cutting edge. This type of blade desired on knives that are used frequently. Tang - The tang is the part of the knife blade that extends into the handle. The length of the tang is thought to be significant in the ability to balance and control a knife. Various manufacturers believe that producing a knife with a tang that extends throughout the full length of the knife is most desirable. Other manufacturers argue that each piece of a knife benefits from using a different metal. Investing in a solid, heavy, well balanced knife that you feel comfortable with is the overall objective. Metal Rivets - Metal rivets are used to secure the tang to the handle of the knife. To prevent irritation to the hand, the rivets should be completely smooth and lie flush with the surface of the handle. In addition, this will help prevent debris and microorganisms from collecting in the spaces between the handle and the rivets. 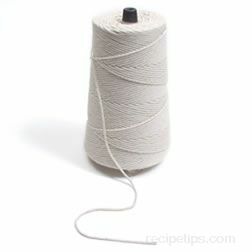 Bolster - A bolster is a thick piece of metal (collar or shank) that is placed between the handle and the blade. The purpose of a bolster is to provide safety from the blade and add balance to the knife. Wood - Wood handles provide an excellent grip, but requires more maintenance than a plastic or stainless steel handle. Critics argue that wood handled knives absorb microorganisms. Tip: Never submerge wood handled knives in water and rub the wood occasionally with mineral oil. Wood Handles Infused with Plastic - A combination of the best attributes of wood handles and molded plastic handles. They have an excellent grip but do not require the maintenance all wood handles require. 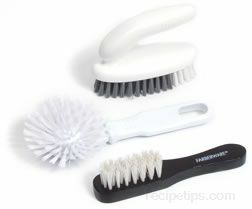 They are also not as porous as wood handled knives, preventing the absorption of microorganisms. Molded Plastic or Composition - Molded plastic handles are much easier to care for than wooden handles. They will not absorb debris and microorganisms and are easily cleaned. Critics argue that handles made with molded plastics become brittle over time and can become slippery in the hand. Stainless Steel - Metal handled knives last longer and add weight to the knife. Critics argue that they become slippery in the hand. The following descriptions and images of knife types are general examples only. Although the basics of each knife style is the same, manufacturers have many variations of how each type of knife looks. Chef's Knife - Also called a cook's knife. An all purpose kitchen knife that is used for most types of chopping, dicing, mincing, and slicing. Chef's knives come various lengths of 6, 8, 10, and 12 inches. The length of the knife you purchase is significant. The longer the knife, the heavier and more difficult it will be to handle. Small handed cooks should choose shorter blades while large handed cooks will prefer longer blades. Carving Knife - A knife with an 8 to 15 inch blade used for carving large roasts, poultry, and filleting large fish. The blade edge of a carving knife is either smooth or beveled. The blade should be large enough to carve across the cut of meat, poultry, or fish in one sweep. The blades vary in flexibility. A carving knife with a rigid blade is used for slicing roasted meats; more flexible blades for poultry; and the most flexible blades are for slicing smoked pork and fish. Carving knives are often sold in sets with a carving fork. A carving fork is designed to hold the meat steady while slicing and keep the hand safe while cutting. These forks typically have two long, curved prongs. Some manufacturers refer to carving knives over 9" as slicers. Paring Knife - A small knife with a sharp blade that is generally three to four inches long. 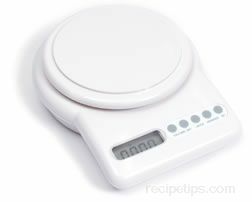 It is easy to handle and works well for peeling and coring foods. The blade is typically thin and narrow and tapers to a point at the tip. Serrated Knife - A knife with a sharp edge and saw-like notches or teeth. The blade of a serrated knife is 5 to 10 inches long. Serrated knives are difficult to sharpen; therefore many chefs spend less on a serrated knife and buy new more often. A serrated knife with a long blade is used to slice through food that is hard on the outside and soft on the inside, such as slicing through the hard crusts of bread. A serrated knife with a short, thin blade is intended for slicing fruits and vegetables. Utility Knife - A small lightweight knife, which has a blade that is generally 4 to 7 inches long and is used for miscellaneous light cutting such as fruits and vegetables. Boning Knife - A knife with a thin short blade, typically 5 or 6 inches long, used to remove the main bone within a cut of meat, such as a ham or a beef roast. A boning knife will typically have a long narrow blade for ease of manipulation around bones, that is rigid and proportioned to the size of the bones being removed. Bigger cuts of meat require a larger more rigid blade that will not be too flexible and cause injury if it bends too easily, while smaller meat cuts can be trimmed and boned using a smaller less rigid blade. Filet Knife - A knife consisting of a thin flexible blade, typically 6 to 11 inches long, used for filleting fish. The narrow blade enables the knife to cleanly move along the backbones of the fish, in and around areas adjacent to bones, and to evenly slice along the skin, removing it easily from the flesh. 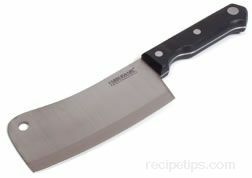 Cleaver - A knife with a wide rigid blade approximately 6 inches in length, which tapers to a sharp cutting edge. This tool is used to chop, shred, pound, or crush food ingredients and materials. The blade of the cleaver is thick, somewhat heavy and well balanced with a beveled cutting edge, which allows for ease of chopping through vegetables or materials as hard a bones with the beveled blade. The flat blunt side of the blade can be used to pulverize meat. If the handle is flat on the end it may be used to crush seeds, garlic or other similar ingredients. A hole is typically provided on the top end of the blade to allow for ease of hanging this tool. Santoku Knife - A type of knife commonly used to prepare ingredients for Asian food dishes. This knife is very similar to a chef's knife with a wide blade that has a long straight edge curving up slightly at the end. The main difference is that the santoku knife has a wider blade that is thinner in thickness, shorter in length, and curves up very gradually at the end providing a straighter cutting edge. Constructed of stainless steel, this knife will typically be expensive to purchase, since it is precision made to be well balanced and well formed for ease of handling and greater control. With a thinner blade than a chef's knife, the santoku can cut smoothly and more precisely through dense vegetables, which may have a tendency to provide more resistance when using thicker width blades. Steak Knife - A knife used for cutting main courses such as steak and chicken. The knife usually has a blade that is 4 to 6 inches long and varies in thickness. Depending on the manufacturer, the blade may or may not be serrated. 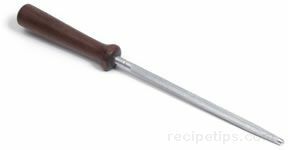 Mincing Knife - A knife that can be used to mince or cut foods into smaller bits for seasoning sauces, soups, salads, and other dishes. 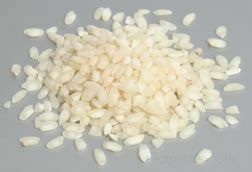 Mincing knives can be either single or double bladed to cut a variety of foods into very small pieces. A mincing knife is also referred to as a Mezzaluna, Mezzaluna chopper or Mezzaluna knife. Another version of a mincing tool is the rolling mincer or rotary mincer. This utensil consists of numerous circular blades, close together mounted on a handle, enabling the user to roll the tool back and forth over the herb as the blades do the mincing. Oyster Knife - A kitchen utensil that is used to pry open the hard shell of an oyster or clam in order to remove the meat. Typically, the knife will have a sharp, beveled blade that can be inserted into the tightly closed shell to pry the shell apart. The blade is then used to cut through the muscle and oyster membrane. A round shield is built into the handle in order to keep the knife and hand from going into or through the sharp edged shell. Devein Knife - A kitchen utensil that is used to remove the large vein that runs down the length of a shrimp. A fork can be inserted in the back of the shrimp to pull out the vein or a deveining knife can be used to cut a slit down the length of the shrimp. This tool is inserted at one end of the shrimp and then pushed up through the entire body to remove the vein and the shell at the same time. Clam Knife - A kitchen utensil that is used to pry open the hard shell of a clam or an oyster in order to remove the meat. Typically, the knife will have a beveled edged blade that can be inserted into the tightly closed shell, twisting the blade to pry the shell apart. A round shield is built into the handle in order to keep the knife and hand from going into or through the sharp edged shell. Grapefruit Knife - kitchen utensil that is made for ease of cutting the meat of the fruit away from the grapefruit skin when preparing a half grapefruit for serving. There are several varieties of this tool available, either single or double bladed, each containing at least one serrated blade. The dual bladed knives have serrated blades on each end of a handle placed in the center. The curved blade on one end is used for cutting the meat away from the outer skin. The second blade may consist of two closely aligned parallel blades or one blade with a slit in the center, each used to cut between the lining that separates the inner meat into sections. The grapefruit knife effectively serves a good purpose of separating the meat sections of grapefruits better than the average kitchen knife. 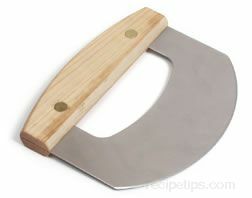 Cheese Knife - A kitchen utensil that is thinly shaped to cut easily through soft or hard textured cheese. This knife may have a forked tip that is used as a lifter for pieces of cheese as they are cut. This knife may also be referred to as a forked-tip utility knife, which is used as a bar knife for cutting through citrus fruits or spearing garnishes for drinks as may be required for pickles, onions or maraschino cherries. Chestnut Knife - A kitchen utensil that is used to score the chestnut prior to roasting. By carving a line, a cross or an "X" into the shell of the unroasted nut, it allows it to breathe during roasting and to resist exploding as the steam builds up. The chestnut knife is short shafted in order to keep the cut confined to the shell without going too deeply to pierce the inner skin. When preparing, place the nuts in a shallow pan and roast at 425 degrees for 30 minutes or slightly less. Following roasting, the knife can then be used to open the shell to remove the meat. To remove the nut, make a single score/cut fully around the middle of the shell. The nut may stick to the skin, but should be adequately separated to remove the nut easily. Tourne Knife or Peeling Knife - A knife used to peel, slice, trim and dice small fruits, vegetables and cheese. The blade is curved and usually 2-3 inches long. 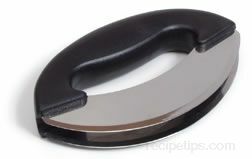 Slicer - A knife used to slice cooked meat. The blade is long, typically 8-12 inches, with a round or pointed tip. Depending on the manufacturer, the blade may be flexible or rigid. Some manufacturers refer to slicers under 9" as carvers. To extend the lifetime of your knives, wash them by hand. Knives that are washed in the dishwasher are exposed to harsh detergents and scalding temperatures. Damage is likely to occur to the sharp edge of a knife if allowed to be thrashed around in a dishwasher. Wipe knives clean immediately after use to prevent the discoloration of the blade. This practice will also help to prevent foods from hardening onto the blade, allowing for ease of cleaning. Tip: Safely clean knives by laying the blade on a flat surface, wipe one side with a wet cloth, turn, wipe the other side. Always use hot, soapy water to clean a knife that has been used to cut poultry, meat, and/or fish. Tip: To prevent contamination, wash cutting boards with hot soapy water immediately after use. Cutting boards should be sanitized by spraying the surface with a solution of bleach and water, letting it stand for a short time, then wiping it with a clean cloth. A finishing tool that is used sharpen steel blades of knives and cutting utensils. Most often rectangular in shape, the sharpening stone may be 1/2 to several inches in thickness. Several common varieties include the whetstone or the carbonrundum stone. A whetstone is made from silicone dioxide minerals that are mined and separated into soft, medium or hard grade stones. To prepare the stone, a light weight lubricating oil is added to the stone in order to stimulate the natural oils within that assist to sharpen a blade as one edge is lightly rotated in a circular motion on the stone. Different grades of stones provide different results for heavier or lighter grade steel blades. A carborundum stone is an abrasive material made of silicon carbide that shapens blades and, over time, deteriotes in surface structure as continual sharpening wears down the carbide material. Rectangular in shape, this stone ofen has a smooth and a coarse side, referred to as a double-grit stone. The coarse side is used first and then the knife is finished by using the smooth side. To sharpen the blade, one side of the blade is drawn straight across the flat surface of the stone. The knife is then turned over to the other side of the blade and the process is repeated. The coarse side enables the blade to be ground into shape fairly quickly while the smooth side adds a smoother finish and a sharper edge, eliminate minute rough edges. A tool, generally made of steel, that is used to hone knife blades and keep their edges straight in between sharpening. The tool can also be glass, ceramic, or diamond-impregnated metal.